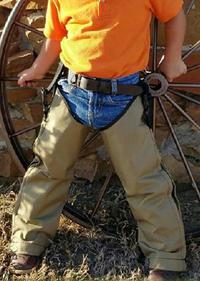 Snake Chaps are worn over pants -- choose below the knee or full protection. Snake Chapz cover from your ankle to your thigh and are easy to walk in. The 1000 denier nylon encases polycarbonate inserts which provide snake proof protection to a minimum of 19 inches (approximately to your knee). Use sizing chart to the right. 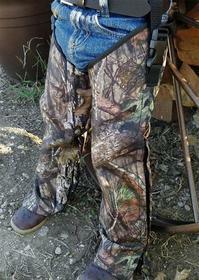 Light weight (15 ounces) Snake Chaps are secured in place with a 1 inch polyester strap, which may either be slipped through a belt loop or over the belt and are connected by a polycarbonate quick release buckle-- providing a "full range" height adjustment. Snake Chaps feature YKK zippers on the inside of each chap to make them easy on/easy off over heavy boots or shoes. Treated with a water repellant coating. Heavy shoes are required for foot and ankle protection. Snake Chaps are to be worn over regular clothing. Made in the USA. 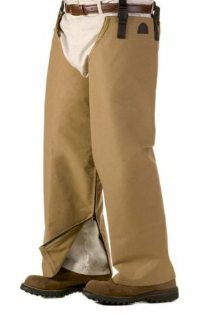 Snake proof from ankle to knee; keeps pants dry and clean above knee. Snake Chapz FP (full protection) are manufactured with 1000 denier nylon that encases polycarbonate inserts. 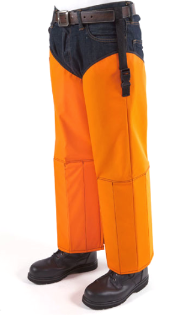 Snake Chaps FP are snake proof to a minimum of 19" high (approximately to your knee) by the polycarbonate inserts, and then to the top of the chap by 18 ounce polyurethane impregnated nylon. This allows knee action while providing snake proof protection to the top of the chap. 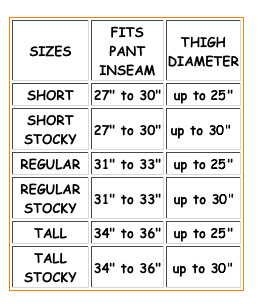 Use sizing chart to the right. 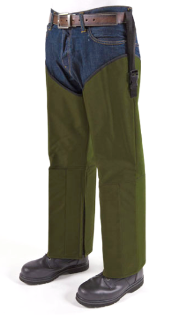 Snake Chaps FP are stiff and hard to walk in, but necessary for working in snake-infested swamps or streams. Snake Chaps feature YKK zippers on the inside of each chap to make them easy on/easy off over heavy boots or shoes. Snake Chapz are secured in place with a 1 inch polyester strap, which may either be slipped through a belt loop or over the belt and are connected by a polycarbonate quick release buckle-- providing full range height adjustment. The Snake Chapz Full Protection are the best snake leggings you'll find! Made in the USA. 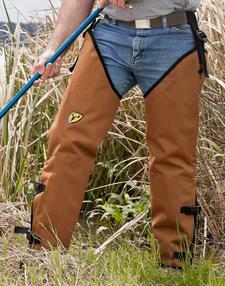 Snake chapz Full Protection are best for working in snake-infested swamps or streams. 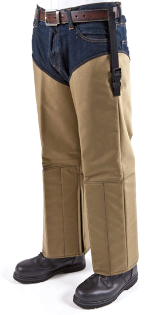 These flexible, protective snake chaps are hand made in the United States, and built to last for years. Weighing only about 2 pounds, which is about a third of the weight of other snake chaps, the Turtleskin premium brand is the lightest and softest snake chaps on the market. For hunters and hikers looking for snakebite protective apparel, you've found the most popular choice for avid outdoorsmen amd women. The SnakeArmor used in these Chaps is made from high performance textiles. This textile design offers a super lightweight and flexible feel. If you are struck by a venomous snake, the venom will not penetrate. Comfortable to wear all year round — not too hot or heavy to wear during warmer months. Also are wind and water resistant, making them a great option to wear during wet or colder seasons. Parents can now have peace of mind when their kids are with them in snake country— outfit your younger children with the same snake bite protection that you are wearing! Youth Snake Chapz design offers 100% full protection from the ankle all the way to the thigh, with comfortable knee movement. Penetration tested to ASTM-1342-05 standards like all Crackshot brand snake bite protection products. Available in 2 colors and 8 sizes to ensure a perfect fit when worn over pants and with sturdy boots that fangs cannot penetrate. Made in the USA. 100% full protection for children from ankle to thigh. These chaps provide excellent protection from all poisonous North American snakes. Constructed from spun polyester duck with a neoprene coating and featuring 2 adjustable, quick release buckle closures and adjustable straps for different inseams. Constructed from spun polyester duck with a neoprene coating.